My sister recently gave me my grandmother’s recipe books. I fell upon them hoping I would find some secret miracle recipe – Haggis for 200 didn’t quite do it but it sent me back in time – pans of marmalade constantly on the boil, perfect cinnamon oysters, Victoria sponge as high as the sky, and the trays and trays of club sandwiches for the Saturday night ‘hoolie’ at the Caledonian Society. I was sharing with John King, a friend and fellow food fanatic and we got to talking about family recipes. He told me about his Italian grandmother’s parmigiana. I’m only recently in love with aubergine. They are quite bland and can be bitter if not cooked properly. We used them a bit at LCB, mainly with lots of other herbs and of course, tomatoes. 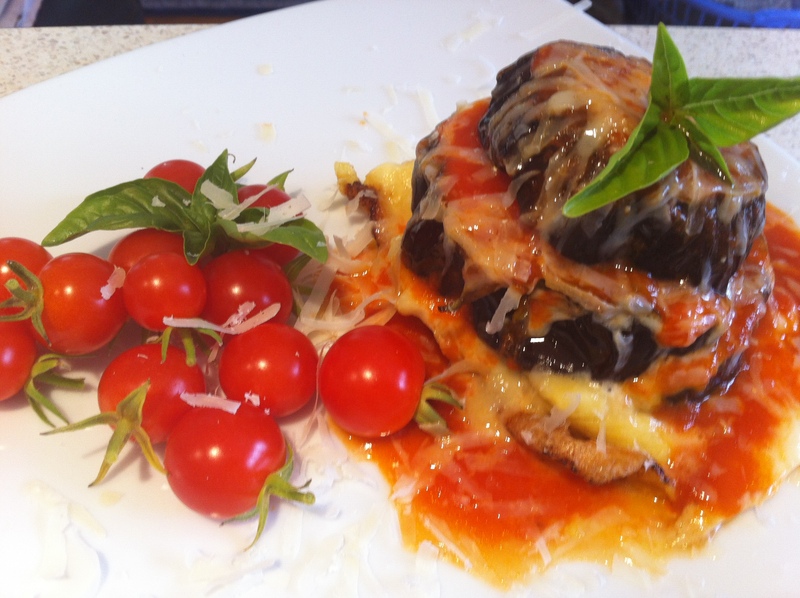 This parmigiana was a big hit – tasty and tomatoey. We had it as a main meal and it was substantial but it would be fab with a piece of grilled chicken or pan fried fish. 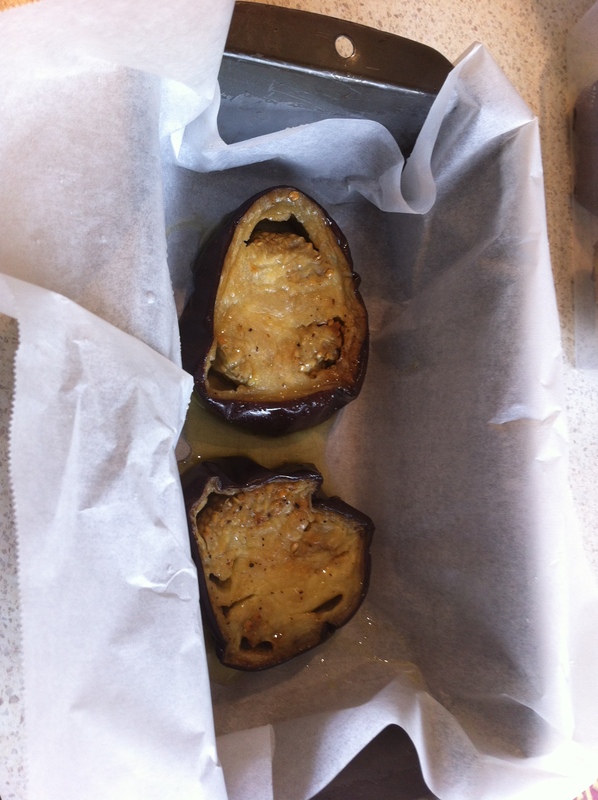 John’s gran sliced the aubergine length-wise but I wanted to serve it as an individual tower so I cut it in rounds. I mixed egg and parmesan for the first layer. Second layer was fresh mozzarella and a couple of basil leaves. The tom sauce was onion, garlic, basil and heaps of marts. I strained it so it was delightfully smooth and seed free. Well worth the effort. That looks and sounds delicious- I am keen to hear more about your grandmother’s recipe book. Welcome back! 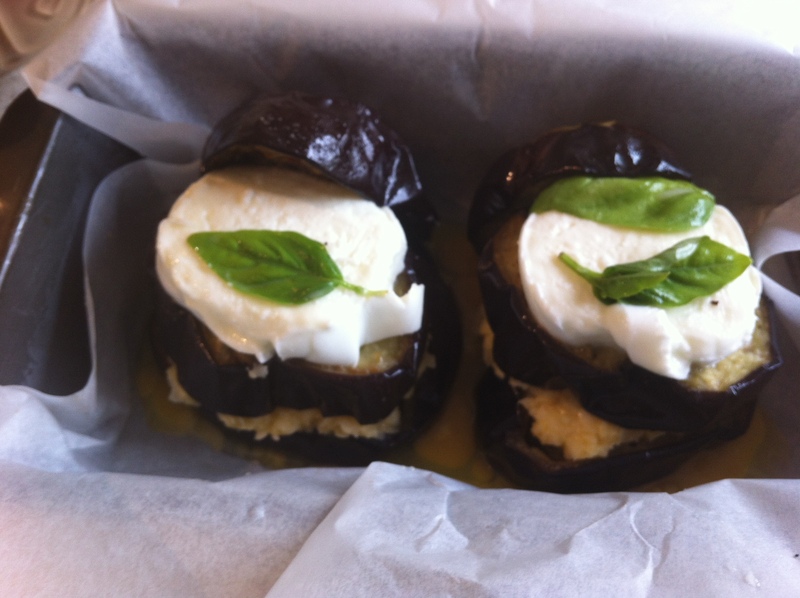 Looks great – I’ve got an aubergine floating around, will give it a go. I shall try the tower method tomorrow, Oo la la! Great to see you’re still blogging. Haggis for 200? I would LOVE to see that recipe! How many sheep’s stomachs does it take to serve that much haggis? !